Out of all the shrubs, trees, and perennials in your yard, hands down the plant that requires the most amount of water is the grass in your lawn. For how much you water your lawn, you’d expect to have a giant puddle in your backyard by now. It seems as if the thirst is unquenchable and you're doomed to have a brown crunchy lawn for life. Is it time to give up and pave over the entire yard? Probably not, but it may be time to install an irrigation system. So why does grass need so much water anyway? To answer that question, we must clarify the type of grass being used. There are several dozen varieties of grass, with many being drought resistant. 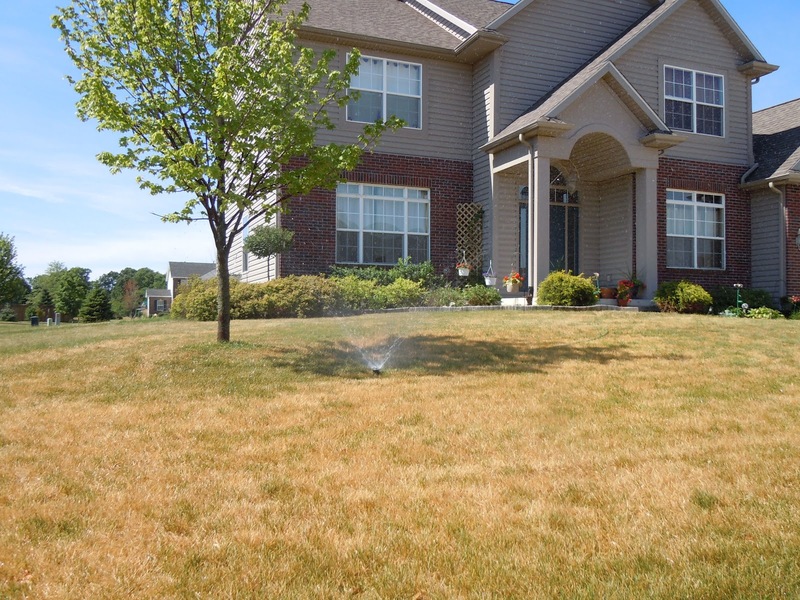 Most residential lawns however, use Kentucky Bluegrass or some type of bluegrass and ryegrass blend. This particular grass has a very shallow root depth compared to other grass types and native plants. When used for residential landscapes and commercial landscapes, the grass is mowed down to just a few inches forming a close mat or carpet. These two features are the main reasons for the massive amounts of water required. Looking at these images comparing root depth of ryegrass and bluegrass to other plant species, you see how drastic the difference is. Lawn grass may only reach down a few inches into the soil whereas most prairie plants can have a root depth of several feet. When summer temperatures heat up and rainfall decreases, the grass begins to rely on water stored in its root system and the moisture in the soil. When the roots are only a few inches deep though, there isn’t much water stored up for the grass to tap into. The grass begins to dry and thin out due to the stress and slowed growth. That means constant watering is needed just to keep the roots hydrated and the leaf green. Roots that are deep can tolerate droughts much longer. roots down further into the soil, all of its energy is spent trying to regrow and heal itself. With a much shorter height, the grass dries out quicker since it's exposed. When the grass is long, it stays cooler and holds onto morning dew or rainfall much longer. Because of these known characteristics of lawn grass, most good landscape companies will recommend installing a residential irrigation system before a new lawn installation. If proper amounts of water can’t be relied on, establishing the grass and keeping it alive will prove to be very difficult. The alternative option to an irrigation system is to get creative with the design of your lawn. Use a different grass blend that is more drought tolerant, or be selective about where you install lawn grass. Lawns are a great feature in residential design, but be aware of the maintenance required to achieve the perfect green carpet.